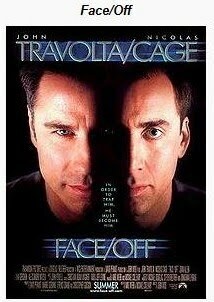 TCP - Behind Bars "Face Off"
The week Tuesday Couch Potatoes featuring movies about behind bars and my pick would be "Face Off"starring John Travolta and Nicholas Cage. It's an action drama movie directed by John Woo. The two both play an FBI agent and a terrorist, sworn enemies who assume the physical appearance of one another. The film exemplifies gun fu and heroic bloodshed action sequences, and has Travolta and Cage each playing two personalities. It was the first Hollywood film in which Woo was given complete creative control and was acclaimed by both audiences and critics as a result. Eventually grossing $245 million worldwide, Face/Off was a financial success. In this movie Nicholas Cage change his appearance to look like John Travolta and went into jail to find any information about the location of the bomb through the brother of John Travolta who is inside jail too. This is a 1997 film so I am certain that most of you hjave seen this movie. To those who missed or forgot this movie here is the Synopsis from the rottentomatoes.com. The ordeal of superheroic, singularly dedicated FBI agent Sean Archer (John Travolta) is only beginning after finally capturing his archnemesis, Castor Troy (Nicholas Cage), an elusive, maniacal... The ordeal of superheroic, singularly dedicated FBI agent Sean Archer (John Travolta) is only beginning after finally capturing his archnemesis, Castor Troy (Nicholas Cage), an elusive, maniacal terrorist who claimed the life of Archer's son. While Troy languishes in a coma, Archer surgically "borrows" Troy's face in an attempt to gather evidence about Troy's last bomb--which is currently ticking away in a Los Angeles office building. Trouble ensues when Troy wakes up faceless, borrows Archer's visage, and makes a mess of Archer's life; all the while, both men struggle to adapt to their new identities while struggling to blow each other away. Another balletically filmed, thematically complex action-smorgasbord from Hong Kong-vet John Woo. Academy Award Nomination: Best Sound Effects Editing.